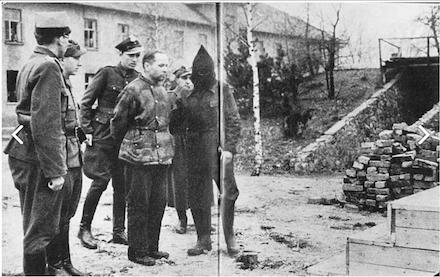 Luxembourg Nazi Damian Kratzenberg was shot as a World War II collaborator on this date in 1946. Kratzenberg (English Wikipedia entry | German | Luxembourgish), an ethnic German and unabashed Germanophile, was a schoolteacher who became in the 1930s a prominent public advocate for Luxembourg’s adherence to the Third Reich. He would eventually found a domestic Nazi collaborator organ, Volksdeutsche Bewegung and though it soon saw its desired German occupation its efforts to propagandize for a voluntary Luxembourgish embrace of Berlin were unavailing. 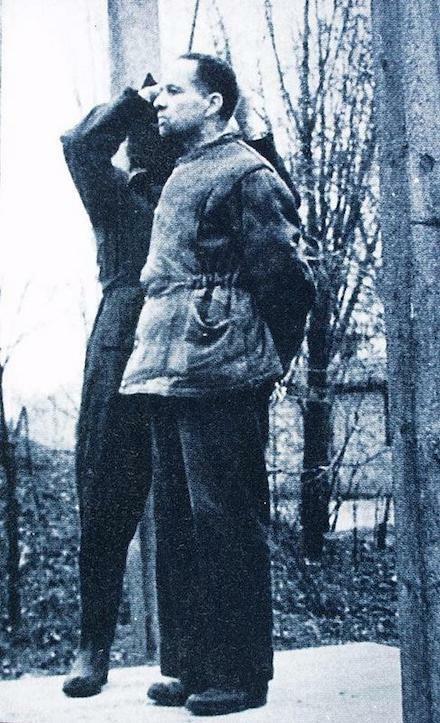 Kratzenberg fled for Germany when Luxembourg was liberated in September 1944, but he gave away his hiding-place in a letter to his daughter, resulting in his capture. 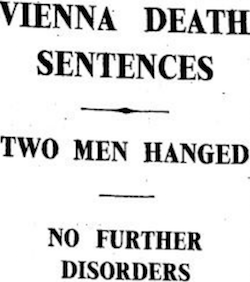 On this date in 1934, two Nazis were hanged for their part in a failed Austrian coup. From his political ascent in 1933 — and well before, as the quote above indicates — the Reich’s unification with his native land of Austria had been a cherished goal for Adolf Hitler. 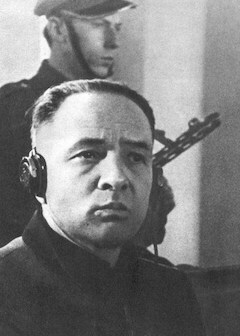 To that end, Berlin had fostered a clandestine network of Austrian Nazis branded as “SS Standarte 89” and allowed exiles to broadcast seditious propaganda from German soil. Their “July Putsch” (English Wikipedia entry | German) was a year or so in the making, and commenced when four truckloads of SS Standarte 89 men in military attire suddenly stormed the federal chancellery in Vienna, murdering chancellor Engelbert Dollfuss in the process. “Hitler received the tidings while listening to a performance of Das Rheingold at the annal Wagner Festival at Bayreuth,” Shirer noted in The Rise And Fall Of The Third Reich — and Wagner’s granddaughter, also in attendance, could not help observing his “excitement” and “delight” and simultaneous anxiety to feign uninvolvement. The last of these impulses showed the emerging tyrant’s wisdom, for the coup swiftly collapsed — exposing, to Hitler’s fury, the inept organization of the plot. Basically no other coordinated actions took place to complete the coup and the Austrian army remained loyal to the existing government, leaving to the lonely SS Standarte 89 nothing but a feeble surrender. 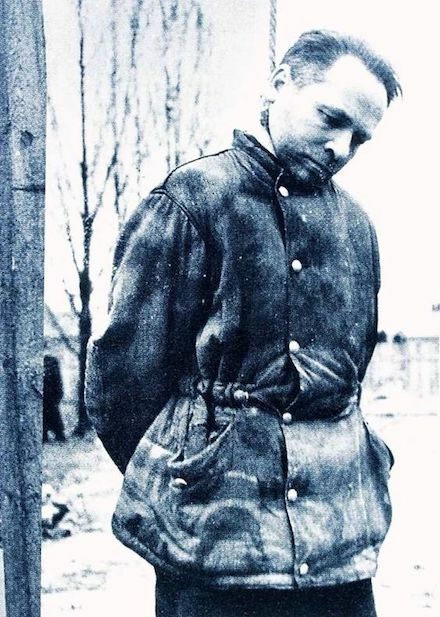 The first targets of the resulting courts-martial were Otto Planetta (cursory English Wikipedia entry | more detailed German), who actually pulled the trigger to kill the chancellor, and Franz Holzweber, the apparent leader of the attack on the chancellery. 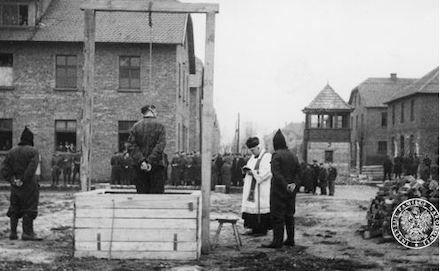 They would be tried and condemned in a two-day hearing July 30-31 and hanged within three hours of conviction. In time, both the Planetta and the Holzweber name would adorn many city streets in the Third Reich as patriot-martyrs. I do not know how many hours I have to live. But one thing I would like to say, I am no cowardly murderer. It was not my intention to kill. One thing more. As a human being I am sorry for my deed, and I beg the wife of the late Chancellor to forgive me. I was assured that there would be no bloodshed. I was told also that I should find Herr Rintelen at the Chancery,, that the new Government was already formed. Not meeting the leader of the operation at the Chancery, I disclosed myself at once to Major Fey. I told him, here I stand, and I do not know what I should do. More or less spontaneously I took over the responsibility for our men because no one was there to take charge of the matter. The time was not yet ripe — and Hitler, no matter how heiled by his would-be subjects, was required by the diplomatic blowback to forswear ambitions on unifying with Austria. But the Fuhrer’s soft whispers of a new future would grow ever more insistent in the months to come, and not four years later the Reich accomplished the Anschluss. 154 German men of the 89th SS Standarte stood up here for Germany on 25 July, 1934. Seven found death at the hands of the hangman. Jewish cabaret singer and silent film actress Dora Gerson was gassed with her family at Auschwitz on this date in 1943. Gerson’s cabaret career was the more robust through the roaring twenties but with benefit of retrospection we admit with Liza Minelli that from cradle to tomb, it isn’t that long a stay. And the ominous next act would not belong to Weimar Jews. Gerson fled Nazi Germany to the Netherlands; once that country fell under its own harrowing wartime occupation, she tried to escape with her family to neutral Switzerland but was seized transiting Vichy France. Gerson, her second husband Max Sluizer, and their two young children Miriam (age 5) and Abel (age 2) were all deported to Auschwitz and gassed on arrival on Valentine’s Day 1943. 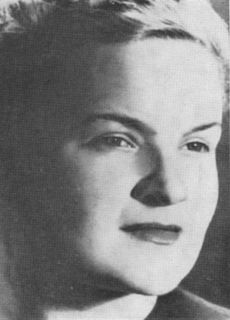 * Her first marriage was to film director Veit Harlan, who would later direct the notorious anti-Semitic propaganda film Jud Süß — based on an executed Jewish financier. From the German-occupied Netherlands, Gerson unsuccessfully appealed to this powerful ex for protection. ** Future horror maven Bela Lugosi also appeared in both Gerson films, Caravan of Death and On the Brink of Paradise. Gerson’s German Wikipedia page also identifies her as the voice of the evil queen in the 1938 German-language dub of Disney’s Snow White and the Seven Dwarves. On this date in 1941, 534 Jewish intellectuals were lured out of the Nazi ghetto in the city of Kovno, Lithuania (also known as Kaunas), taken to Ninth Fort, and shot to death. Over 5,000 Jews would die there during the Nazi occupation. The Nazis had captured these people using a very clever ruse: on August 14, they had advertised for 500 Jews to help sort out the archives at City Hall, which were in disarray due to the chaos that followed the Germans’ conquering the city in June. The workers had to be intelligent, educated types and fluent in German and Russian. They would be treated well and given three solid meals a day, in order that they could do the work properly and make no mistakes. Most of the other jobs available for Jews at that moment involved manual labor under brutal conditions, on starvation-level rations. More than the requested 500 showed up. The Nazis happily took them all. 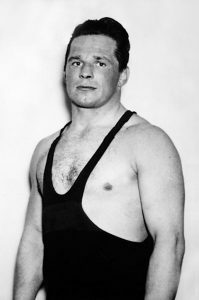 Vilius “Vulik” Mishelski (later anglicized to William Mishell), who was 22 and had studied engineering in Vytautas Magnus University [Lithuanian link], was nearly victim no. 535. His mother told him about the job offer, because it upset her when he home from working at the airfield, “my clothes torn, my face covered with dust and sweat, my fingers bleeding, and I myself so exhausted I could hardly speak.” The archives job seemed like a gift from heaven to her. Why, he asked, had the archives not been sorted out sooner? After all, the Germans had conquered Kovno a full two months earlier. And why not get Lithuanians to do the job? It certainly wasn’t necessary to employ Jews. When he actually arrived at the gate, however, what he saw made him profoundly uneasy. The size of the guard was unusually large, and he witnessed Jewish police and Lithuanian partisans mistreating and beating people. 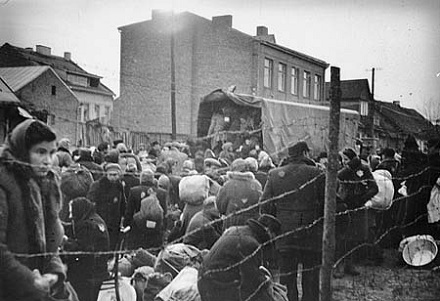 Because it was taking long for the quota of 500 people to arrive, the Lithuanians started dragging people from their homes by force. This struck me as odd. This was supposed to be a job where we were to be treated in a civilized manner; was this the treatment awaiting us? Oh, no, I would not be caught in this mess! Without hesitation, I turned around and rushed back home. My mother was astounded. “What happened, why are you back?” she asked. Vulik was right not to trust the Nazis’ promises. He stayed in his hideout, a little cubbyhole behind the kitchen cabinet, all day. The chosen 534 didn’t return that night, or the next night either, and no one believed the assurances that the work was taking longer than they thought, and they had spent the night at City Hall. Before long, the truth leaked out. That same day, the men had been lead away in several smaller groups to an area containing deeply excavated holes in the ground. Then the Lithuanian guard, known as the Third Operational Group, had shot them all. Several men who tried to escape were killed on the run. 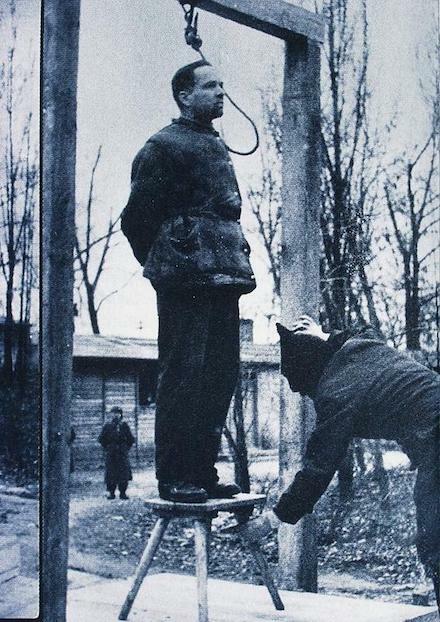 Almost the entire intelligentsia of Jewish Kovno had thus been liquidated in one mass execution. 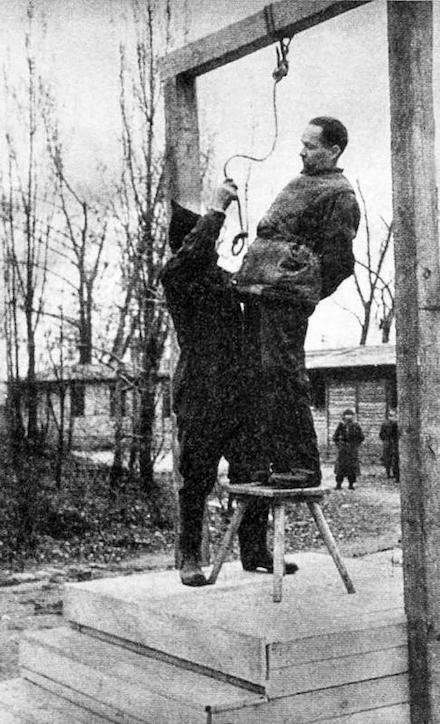 Mishelski stayed in the Kovno Ghetto until 1944, when he was sent to Dachau. He survived the war: 95% of the Lithuanian Jews, including most of his family, did not. Mishelski moved to America, changed his name to William Mishell, got a master’s degree in engineering from New York University, and settled in Chicago. 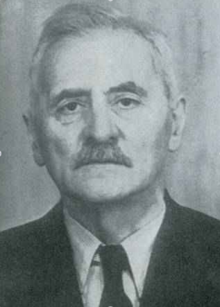 Following his retirement in the 1980s, he wrote a memoir titled Kaddish for Kovno: Life and Death in a Lithuanian Ghetto, 1941 – 1945. Mishelski died in 1994, aged 75.